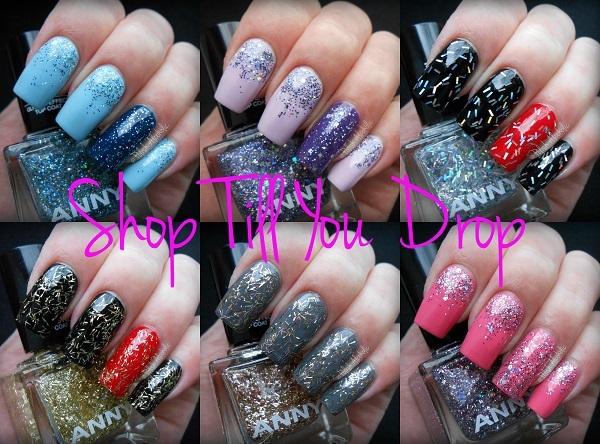 ANNY recently released their Shop Till You Drop Collection. Great collection for the Holidays! Glitter, glitter and more glitter! Scroll down for the swatches and review! All swatches have a base coat and a top coat for a smooth and finish. New nobility, a mix of small and medium size square pink holographic glitter in a clear base. It’s very dense and applies smooth and even. This is a gradient over ANNY’s Pink pants. Be a star, small light blue holographic glitter in a clear base. This also has square holo glitter in the mix but I believe less than the others. Application went very easy. I’ve layered it over ANNY’s Blue love (light blue) and Drunken Jeans (darker blue). Big apple shopping, the purple sister of New Nobility. Shown is a gradient over ANNY’s Lilac powder (pastel purple) and Snow revolution (purple). This combination turned out so pretty, don’t you think? Flying angel, gold and rose bar glitter in a clear base. I’m not a fan of bar glitter but I LOVE this color combination! I found that the application works best when first dabbing the polish on before brushing it out to a smooth finish. The bar glitter stay pretty flat on the nails and isn’t sticking out or anything. At least, not as bad as I’d expected. I did use a generous coat of Seche Vite though! This is one (slightly dabbed) coat layered over ANNY’s Velvet chinchilla. Golden dress, gold bar glitter in a clear base. Not very spectacular or special if you ask me. But still a great topper for the Holidays! Formula and application wise it’s basically the same as Flying Angel. This is one (slightly dabbed) coat over ANNY’S Deep black chief (swatches coming soon!) and Woman in red. Diamond couture, silver holographic bar glitter in a clear base. The glitter is thicker as the others. I thought this would be a nightmare to apply but surprisingly it went on very smooth and even! Shown is one coat over ANNY’s Deep black chief and Woman in red. *ANNY polishes are exclusively available at Douglas stores for €9,95 each (10ml). 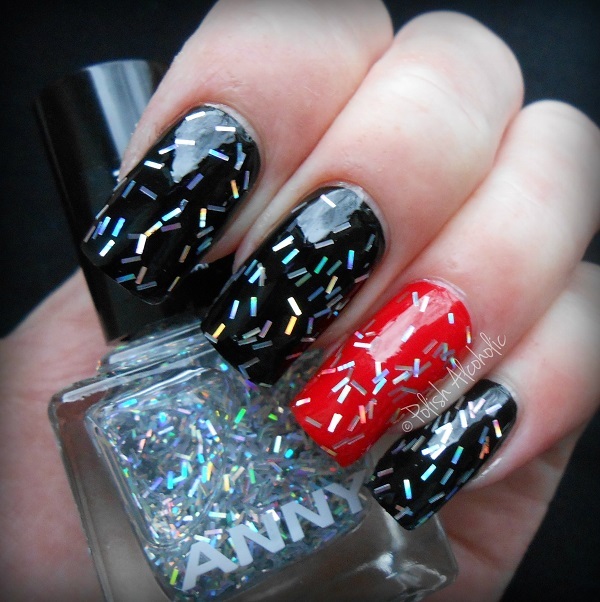 This entry was posted in ANNY and tagged 710, 715, 718, 730, 736, 742, anny, anny shop till you drop, be a star, big apple shopping, diamond couture, flying angel, golden dress, nagellack, new nobility, swatches by Polish Alcoholic. Bookmark the permalink. Great colour / glitter combos! My favourite glitter is Diamond Couture. Love bar glitter and the holo effect is incredible. Ik moet ze nog testen maar bij jou zien ze er prachtig uit! Oh, I love the purple-lilac combo! And Flying angel looks great with that base.